Melinda Markowitz is a Messenger, a go-between for paranormal forces and supernatural creatures. Problem is, when a girl's a go-between, it's hard not to get caught in the middle. 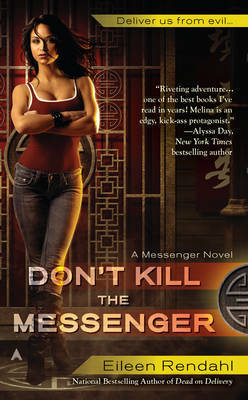 When ninjas steal an envelope from Melinda, her search leads her to a Taoist temple in Old Sacramento, where the priests seem to practice Zen and the art of Mayhem. Melinda must enlist the help of anti-gang cop Ted Goodnight to battle something he doesn't even believe in - without blowing her cover. Eileen Rendahl writes and lives in Davis, California, with her two lovely children, two annoying cats, and one lovely man. Don't Kill the Messenger is her first paranormal romance novel.